The concept of being able to use a notebook as a kind of tablet is not really new anymore. Devices with comparable functions have been available for years now, but they still represent niche products. Since Lenovo tried to use this trend in the mainstream market with its Yoga devices, other manufacturers are introducing more and more new devices with interesting designs as well. The Acer R13 is the latest attempt from Acer to combine all requirements for a modern mobile computer in one device. The manufacturer uses a new hinge technology and a touch display to realize this goal. That the device is primarily designed for professional users is obvious when you look at the components and the pricing. The top version with an Intel i7-ULV processor, two SSDs in a 512 GB RAID 0 configuration, and high-resolution WQHD touch display costs at least 1,500 Euros (~$1832). Other customer groups might favor the HP Pavilion 13-a000ng x360 for half the price, even though the specifications are not really comparable. 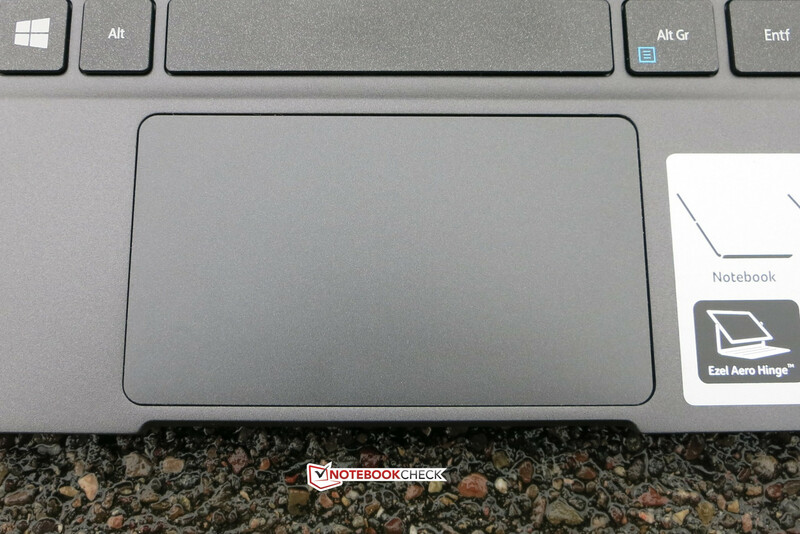 For our review of the Acer R13 we use Lenovo's new Yoga 3 Pro Convertible with the Intel Core-M technology as well as the Sony Vaio Fit 13A multi-flip. The latter is already slightly older, and at a first glance offers a similarly high variability. Can the Acer beat the pioneer from Lenovo? And can the technology as well as features fulfill the promises? 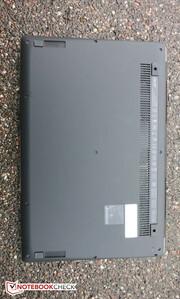 There are no massive metal parts inthe Acer R13. 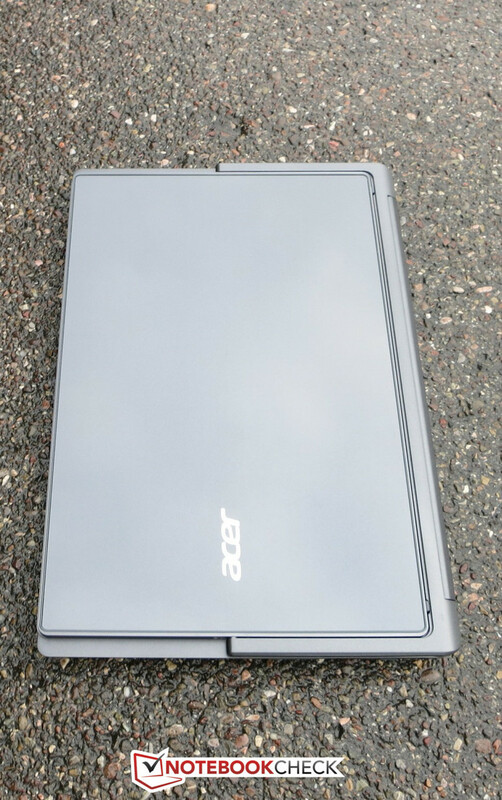 To realize a lower weight, a very compact chassis and low manufacturing costs, Acer only uses plastic parts that actually look a lot like a metal finish, which is achieved by using a thin metal coating. However, this is not a big problem since the whole build quality leaves a really good and sophisticated impression. We could not find any irregularities at the corners or the gaps. The bottom of the chassis is also slightly rubberized, which improves the grip in the tablet mode. Only the display frame and the two support beams of the screen seem to be completely made of metal. The whole construction is very sturdy, despite its filigree appearance. According to Acer, this is the result of two layers of Corning's Gorilla Glass 3, both at the touch surface as well as the back of the display. 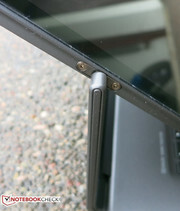 The hinges leave a very sturdy impression: They can even prevent bouncing during touch inputs in the standard laptop mode. 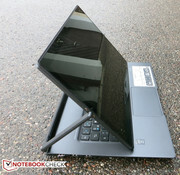 Neither the chassis nor the display can really be twisted in the tablet or notebook mode; compared with other plastic notebooks you can also only slightly dent the chassis. The real innovation is already partly familiar from the Dell XPS 12, but Acer only uses two hinges at the side that enable the 180 degree rotation of the display. Dell still uses an enclosing frame around the display instead of just two support beams in the Acer. 2: The so called Ezel mode, where you use the device like a notebook, but the display is turned so that it is closer to the user. 3: The Stand mode, where you can only use touch inputs, but the display is at a small angle. 4: The usual Tablet mode, where you can obviously use the input pen as well. 5: The Tent mode for the undisturbed viewing of pictures and videos, even with limited space. 6: The Display mode, which offers many of the advantages of the Tent mode, but requires more space. The Acer R13 automatically recognizes the current operating mode and aligns the display according to the current orientation. The dimensions on the other hand, are more comparable to a 14-inch device because of the unique construction. The glass frame around the display itself is pretty thin, but the chassis is protruding by almost 1 cm (~0.4 inches) on each side in the tablet mode because of the folding mechanism. It is still compact with dimensions of around 344 x 230 x 18 millimeters (~13.4 x 9 x 0.71 inches). The Lenovo Yoga 3 Pro is slightly smaller, while on the other hand, the Sony 13A multi-flip is slightly wider. 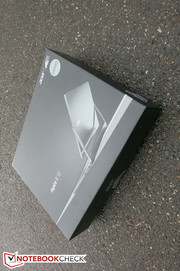 A weight of 1.5 kg (~3.3 lb) is okay for an ultrabook, even though the rivals are slightly lighter. However, the Acer R13 is a bit heavy for a tablet in continuous use. There is no problem when you put the device on your lap as a tablet. Because of the very compact dimensions, the port variety is limited as well. Besides an HDMI port and the usual standards, you do get three USB ports (2x USB 3.0 and 1x USB 2.0), but you will have to forgo a dedicated Ethernet port, for example. At least the USB connectivity of the Acer is superior to the Lenovo Yoga 3 Pro with just two ports, for instance. All the ports of the Acer are located in the rear area of the notebook, so there should not be any issues with colliding cables when you use an external mouse. There is also no problem to use all USB ports at the same time since they are not too close to each other. The HDMI port is fairly isolated as well. The 2-in-1 SD card reader is covered by a small removable tray. Acer has dispensed with a separate Ethernet port to achieve the very compact construction. It can be used with an adaptor, but the latter is not supplied with the device. The Internet can be used with the latest WLAN standards 802.11 a/b/g/n/ac thanks to the Intel Wireless-N 7260 module. Fast transfer rates in local networks are therefore ensured and Bluetooth 4.0 is integrated. We did not encounter any WLAN dropouts during our review and the signal quality was also good (no standardized test). The integrated HD webcam produces acceptable results, also in darker environments. It is clearly superior compared to entry-level solutions in inexpensive notebooks. Two microphones also allow clear communication during video chats. 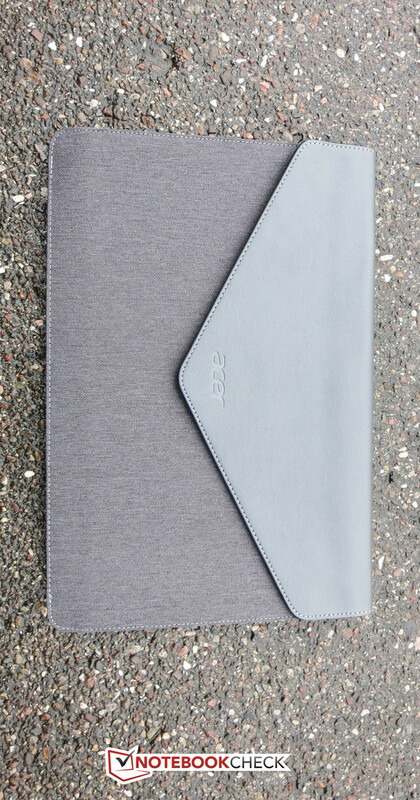 Besides a manual and the 45-Watt power adaptor with a weight of 306 grams (~10.8 ounces including the power plug), the box of the Acer R13 also contains a protective cover. While it is sufficient to safely transport the device, there is no room for additional accessories. Acer also includes an additional digitizer stylus pen, the Acer Active Pen. However, according to the manufacturer’s website, this is not a provided accessory, so you will have to pay around 40 Euros (~$49) for it. Acer does not integrate a separate maintenance cover to access the memory or the SSDs. You will have to remove the whole bottom cover to reach these components, which might be a complicated process because of the completely enclosed chassis. Acer offers a 24-month carry-in warranty for all its notebooks. However, the world-wide warranty, the International Travelers Warranty (ITW), is only applicable in the first 12 months. Warranty extensions to 3 or 4 years are available in Acer's online shop for around 60 and 80 Euros (~$73 and $98) respectively. The most noticeable feature of the chiclet keyboard is the illumination. Unlike many other manufacturers, Acer uses a bluish-white light, which should effectively protect against glare. Although the layout of the keyboard is slightly different from the standard, for example, the Del key is right next to the arrow keys, the most important function keys are at the usual places. The 15 x 15 mm (~0.6 x 0.6 inches) keys allow a smooth and quick typing experience. You can feel the pressure point of the individual keys fairly well, but they still leave a somewhat spongy impression at the peripheral areas because of the limited travel. However, this does not affect the operation. On the other hand, the typing noise is very quiet and convenient, and there is no clattering of the input. The keyboard does not have any separate special keys, but the first row of letters has additional functions that can be used in combination with the Fn key. This also includes the separate controls for the display and keyboard luminance or the volume control. The multi-touch ClickPad of the R13 impressed us as well. 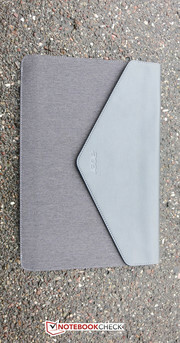 It has a convenient diagonal size of almost 12 centimeters (~4.7 inches). We did not miss the dedicated buttons during our review, it is much better than the less expensive rivals in this regard. The surface is matte but still pretty smooth and provides a good gliding experience, so the fingers do not get stuck. Inputs and clicks are always executed quickly and precisely, even with small movements. The buttons, which are not visually separated, can be triggered across the whole touchpad surface, but the best response is at the lower part of the pad. You can also use precise touch inputs if you prefer the operation via a screen. The panel quickly reacts to inputs, and even clicks on small icons are usually recognized very reliably. Swiping gestures are no problem for the panel. The experience can almost compete with high-quality smartphones, and it is superior to many inexpensive devices. The provided Active Pen can be used for writing and drawing on the display, which also works well in the peripheral areas. However, the digitizer requires a separate battery, which means it is slightly heavier but also leaves a more sophisticated impression. Full HD displays are fairly standard in this price range, which is why Acer has equipped the R13 with another highlight: A matte WQHD IPS display with 2560x1440 pixels and LED background illumination from Sharp. Only the Lenovo Yoga 3 Pro (3200x1800) has a panel with a higher resolution, but the advantages of such a display are questionable. With its display size of 13.3 inches, the pixel density of the R13 is 220 ppi, which is very high for a notebook. This is also the reason why the manufacturer uses the highest Windows scaling option by default. It means you can easily see all Windows elements and fonts, but applications and their contents, like symbols or fonts, can sometimes appear slightly washed out. As well as the Windows scaling, the Pentile display is another reason for these issues. This display type affects the image quality slightly, even though the effect is very small: At a closer look, texts and other elements that usually have straight edges can appear slightly frayed, and the primary colors are slightly blotchy. With standard scaling setting, elements are razor-sharp– you can still use the modern Windows UI without any problems, but all the elements are tiny on the desktop. The other specs of the panel can satisfy us completely. 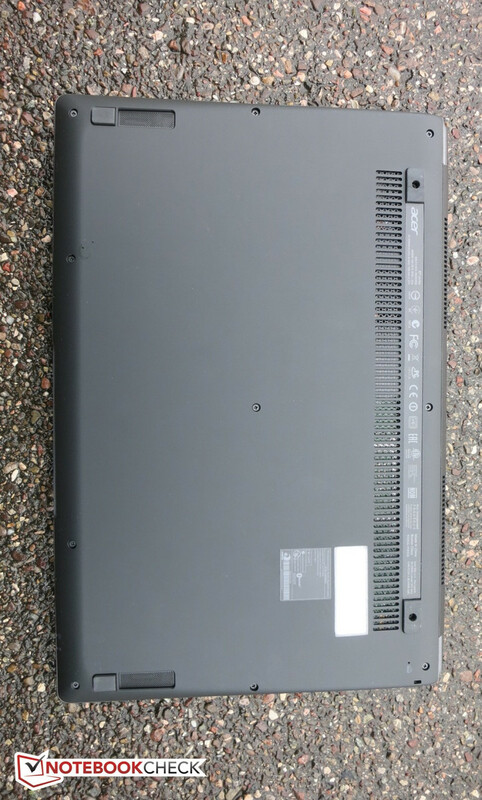 It seems that Acer chose a very good panel. 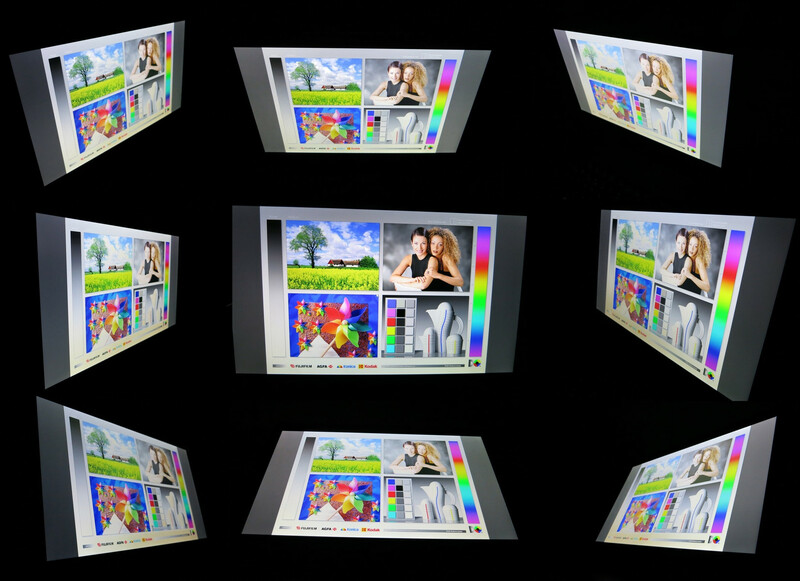 The maximum brightness of 316 cd/m² in the center of the display exceeds the luminance of the Lenovo (278 cd/m²), but falls behind the Sony (368 cd/m²). Still, the panel is subjectively very bright, and the colors are natural and vivid. Clouding from the background illumination is not really an issue, it is just slightly visible in the corners. The black value of 0.23 is almost perfect and results in a very high contrast ratio of 1374:1. This result is way ahead of the rivals. The grayscale performance is decent ex-works with a DeltaE 2000 deviation of 5.16 according to CalMAN. 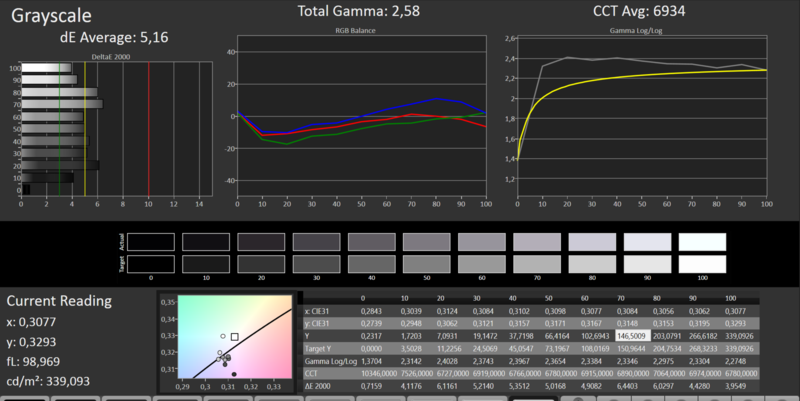 The color accuracy is also fairly good with a DeltaE 2000 value of 4.21 compared to the sRGB reference. Thanks to the rather high luminance and the matte display, the outdoor capabilities of the Acer are very good in comparison with its rivals. There are no real restrictions with regard tothe visibility, especially when you use the R13 under light sunlight or in the shade. The viewing angle stability of the IPS panel can completely impress us. There are hardly any picture distortions, even with very wide angles, the only issue is a slight gray hue from below. The Acer can also impress in the performance section, where high-end convertibles with detachable displays usually have some problems. The manufacturer does not have to use very frugal processors because the processor and the other components are not located behind the display, but in the base unit. Acer has equipped the device with the top version of the ULV-series from Intel, the Core i7-4510U, which meets the price tag. 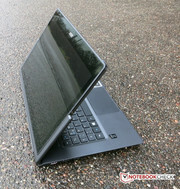 Sony equips its 13A multi-flip with only a Core i5, and Lenovo uses Intel's brand new Core-M platform. Graphics of the Acer are handled by the Intel HD Graphics 4400 with 20 Execution Units, which is integrated into the processor. Together with 8 GB memory and the two 256 GB SSDs in a RAID 0 configuration, the device should be fairly fast. And yes: the convertible always handles Windows smoothly and quietly,even more complex tasks are not a problem. Although the Core i7-4510U is a member of Intel's ULV-series with a 15-Watt TDP, you should not underestimate its performance. The high Turbo clock of up to 3100 MHz is attainable for short periods when only one core is active. If both cores are active, clock speeds can reach up to 2800 MHz. Even though the i7 only has two cores, it can execute up to four threads simultaneously thanks to its Hyperthreading feature. Together with 4 MB L3 cache it can exceed the new Core-M of the Lenovo by 37% in the Cinebench R15 benchmark, and you still have a 19% advantage when you just use one core. However, we have to mention that the TDP of the i7 is specified with up to 15 Watts, whereas the Core-M is much more efficient with a TDP of just 4.5 Watts. 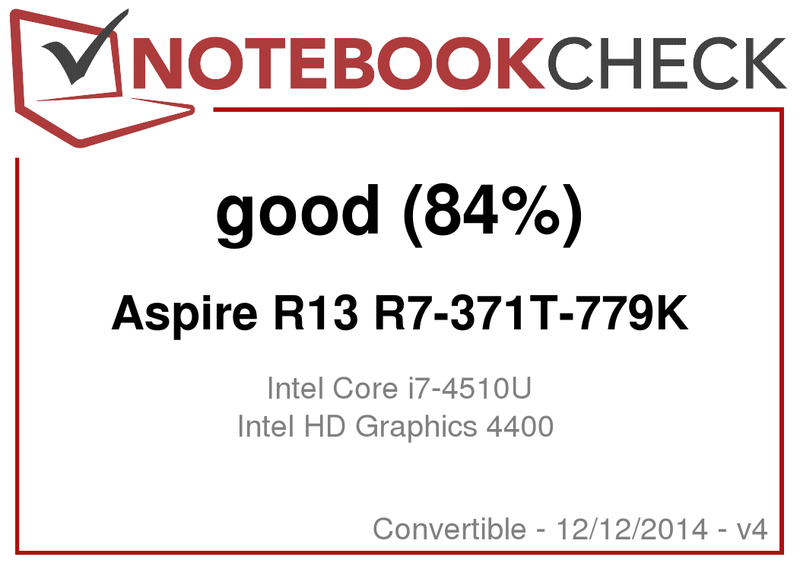 This means the Broadwell chip in the Yoga 3 is primarily competing with the current Intel Core-Y chips. Compare the results with the Core i5-4200U from the Sony, and the performance advantage of our review unit is much smaller. As expected, the i7 is still faster, but the difference shrinks to +9% in multi-core scenarios and +12% in single-core scenarios. The system performance is consistently at a very high level in every category, however, this can be expected for such a retail price. There are no delays when you use Windows or perform office tasks. Thanks to the integrated SSD(s), the boot times are very short and you can start your work almost without any waiting time. The PCMark 8 results are, however, lower than the Sony and also behind the Lenovo. Only the PCMark 7 overall score, which, as we know, benefits heavily from fast SSDs, is much higher compared to the other two rivals. Our subjective impression of the Acer R13 was very positive: During our review period, the application starts, booting times from Windows as well as the reaction times from standby were always fast and we did not encounter any problems. Acer does not equip the R13 with a common 512 GB SSD, but the manufacturer tries to differentiate its device from the rivals with a combination of two 256 GB SSDs from Kingston in a RAID 0 configuration. The user still gets just one drive with a gross capacity of 512 GB, but the transfer rates are much higher. However, there are drawbacks in terms of data security since RAID 0 configurations lack data redundancy and everything is focused on the performance. Write and read operations are distributed on both drives, but this also means the RAID controller cannot restore the data if just one of the two SSDs is defective. The used configuration still increases the transfer rates significantly. While single SSDs usually reach up to 500 MB/s (read and write), the SSD combination of the Acer R13 reaches 823 MB/s with sequential reads as well as 660 MB/s with writes according to the CrystalDiskMark benchmark. Unfortunately, this does not increase the subjective performance impression of the system compared to common devices with just one SSD. Windows and applications start quickly, but not necessarily faster than they would on other high-quality SSD systems. The measured transfer rates are usually not reached in practice, either, since neither USB 3.0 nor external SSD hard drives can keep up with the performance, so a RAID 0 configuration in a consumer notebook is rather a marketing decision right now. The working speed is just marginally increased by the RAID configuration. The graphics card is the familiar Intel HD Graphics 4400, which has 20 Execution Units and a clock between 200 - 1100 MHz in combination with the i7-4510U. It is powerful enough for standard tasks and some older games in lower resolutions, but at the same time very frugal. This means running Windows 8.1 as well as the playback of Full HD videos is never an issue. All the synthetic benchmarks are on the expected level of previously reviewed devices with similar GPUs. Games can be played on systems with the Intel HD Graphics 4400 GPU, but there are considerable restrictions. You should not expect any graphics miracles, but the results are much better compared to the old GMA chips. Simpler games like "Counter Strike: GO" run smoothly with medium details, but the high native resolution of 2560x1440 pixels could be an issue. You will need a much faster dedicated GPU like a GTX860M or higher, to play more complex titles smoothly in these high resolutions. However, the Sony and the Lenovo do not have a dedicated chip either. It is currently just not possible to cool them in such compact constructions. 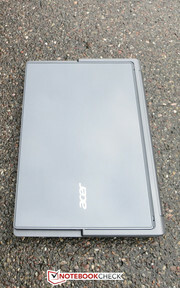 Similar to the other two rivals, the Acer requires an active cooling solution. The fan noise is always quiet and almost impossible to hear. Unfortunately the fan does run – at least almost silently– all the time even while idling, which could have certainly been prevented with a better fan and temperature control. The cooling solution is clearly audible under sustained load, but both the volume as well as the frequency always remain acceptable. The results for the heat development are not that good in comparison with the formerly mentioned rivals. While we could still measure very good and low values while idling, which were even better than the Lenovo, the situation changes when you stress the system. Maximum load (stress test) results in temperatures of almost 52 °C (~126 °F) at the center area of the back. The area around the palm rest on the other hand does not really warm up at all with 26 - 28 °C (~79 – 82 °F) . The high temperatures in the stress test also affect the clocks, both on battery as well as mains power: We can see throttling of the CPU and the integrated GPU after a few seconds of maximum load for both components. The core temperature levels off at around 75 °C (~167 °F) and the clocks fluctuate between a meager 1200 MHz and quick bursts to 2600 MHz within seconds, while the GPU constantly fluctuates between 900 and 1100 MHz. This means you can only utilize the full performance of the processor for a very short time; the cooling solution is not sufficient to maintain high clocks of the i7 for longer periods. We could already see similar behaviors for the devices from Sony and Lenovo, which is a result of the very compact construction. 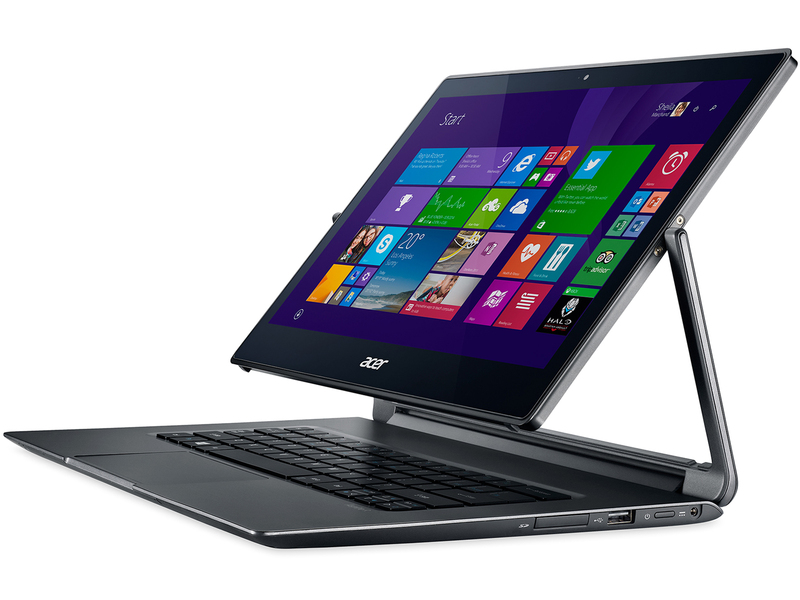 The Acer R13 with the i7 CPU is well equipped for everyday use where you usually have short peak load. The two speakers are located at the sides of the front area on the bottom of the convertible. The speakers feature a DOLBY Home Theater logo and Acer advertises "Cinematic surround sound" on its homepage. The reality is unfortunately slightly different: The slogan sounds better than the actual sound, and the advertisement is almost bold. Distortions are only a problem with higher volumes and the sound is pretty clear, but the deep tones and bass are not present at all. This is not unexpected when you consider the pretty compact construction and the missing subwoofer. Still, the speakers are sufficient for Internet videos, video chats or the occasional music playback. The power consumption is on a normal level for a system with an Intel Core-i processor. 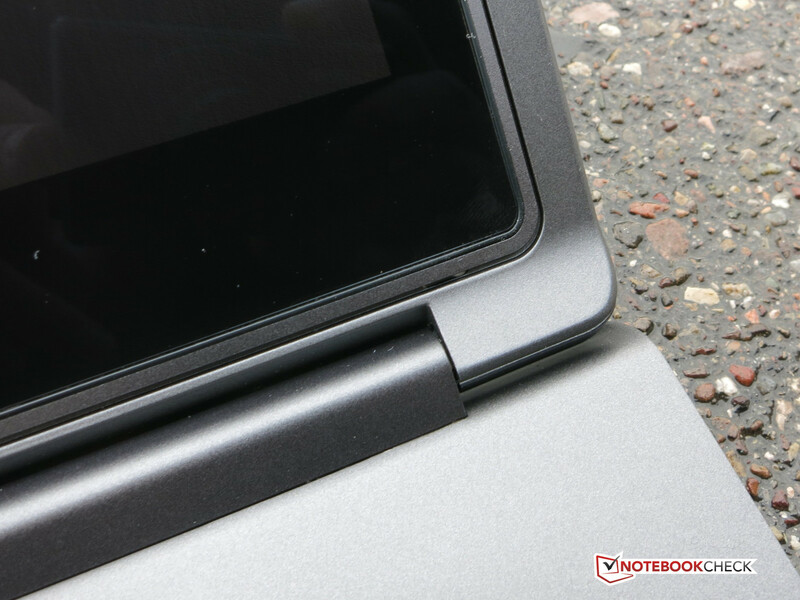 Even the Lenovo Yoga 3 Pro with the new Core-M is just slightly more frugal while idling. The performance difference between the i7 and the Core-M is more noticeable under load, where the Acer consumes over 6 Watts more than the Lenovo with the new Broadwell processor. Compared to the 44 Wh battery in the Lenovo, Acer equips its convertible with a pretty generous 61 Wh module; Sony on the other hand only uses a 36 Wh battery. The Lenovo system can compensate the difference with the Acer thanks to its lower power consumption. The Acer R13 manages very good results for the battery runtimes. The idle test determines a runtime of 8:40 hours. The WLAN operation is possible for 6:38 hours and the video playback runtime is on a similar level. Maximum load on the other hand results in a runtime of just 2:28 hours, but such a load scenario is not very likely in practice, so even more complex scenarios should result in a longer runtime. 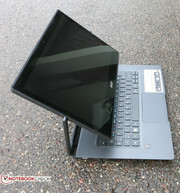 Acer managed to combine almost every possible operating mode in one device, without having to make any significant sacrifices in terms of the handling. If you do not mind the slightly increased dimensions for a 13-inch device, and if you are also ready to pay the high price, then the Acer R13 is a very good choice for a convertible. Handling and features can almost completely impress us; the high-resolution display in particular is a joy when you use Windows 8.1. The build quality is on a very high level, despite the plastic. There is, however, the question of whether the additional charge for the Intel i7 processor is really worth it or if a lower price with a powerful i5 would have been the better compromise. Both chips are very similar except for the slightly higher nominal and Turbo clocks as well as the 1 MB bigger cache. The manufacturer probably thought they should only use the best components in this price range to differentiate the device from the mainstream offerings. ... you can use different operating modes. The folding mechanism is very sturdy. High build quality in combination with powerful components and a good display. The price is unfortunately pretty high and the processor is not much better than a good but cheaper i5. Acer really managed to combine all operating modes in one device, but the convertible is still compact and pretty light.